You will receive a confirmation of your registration by e-mail. What software was used to create the portal ? Apache http server: multiplatform web server. Apache Tomcat: web container for Java for managing and executing Java components that are used to create dynamic data and web pages. Geonode: software platform for developing geospatial information systems (GIS) and spatial data infrastructures (SDI). Geoserver: open-source software server written in Java that allows users to share and edit geospatial data. Designed for interoperability, it publishes data from any major spatial data source using OpenGis standards. Geonetwork: catalog application to manage spatially referenced resources. It constitutes a decentralized and standardized system for managing spatial information. It has been designed to access databases online that contain georeferenced data, cartographic material and associated meta data. The system implements the OGC-standard WCS (Web Catalog Service). Django: Python-based web development platform. DjangoCMS: content management system used for developing websites or an intranet. It is based on the Django platform and has been written in Python. PostGIS: extension of PostgreSQL used for manipulating spatial data (geometric types such as points, lines and polygons). PostGis complies with the OGC (Open Geospatial Consortium) OpenGis standards. Java: object-oriented computer programming language. The software written in this language can be used without much adjustment on several operating systems such as UNIX, Windows, MAC OS or GNU/Linux. Python: object-oriented multi-paradigmatic and multi-platform computer programming language. How to add a data layer to your map ? Click on the icon “Add layers” in the cartographical tools toolbar. 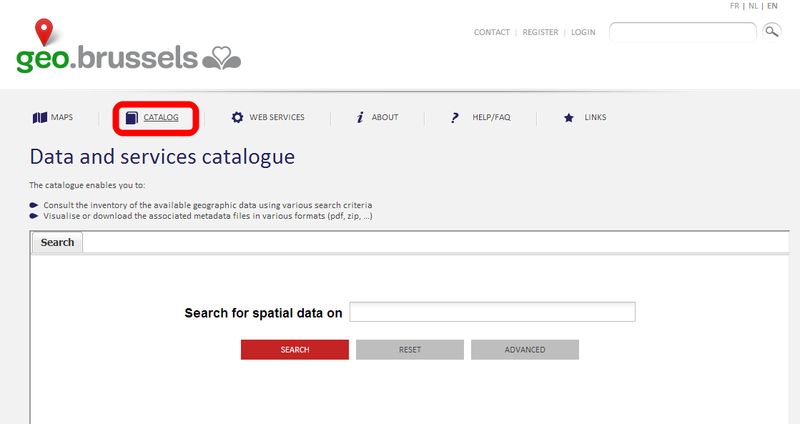 You can add data which have been dispersed by the partners of this geoportal (tab “GeoBru data layers”) or data from another web service (tab “External layers”). In order to add a GeoBru data layer, select the desired layer from the list or search the available layers in the search engine by means of a key word. To select multiple, press the “CTRL” key button. Then click on the “Add” button After all the layers have been added, return to the cartographical tool by clicking on the “Close” button . In order to add data from another web service, first enter the desired web service’s URL: click on the “Add another webService” button , enter the URL and then click on the “Add” button . The web services previously used when logged in with your user profile, are accessible through the dropdown menu “View available data from WebService”. Then proceed as described above for the GeoBru data layers (attention: the search engine with key words will be unavailable). The added data will hence feature in the thematic map layers and will be displayed on your map. The grey layers cannot be visualized in the selected scale. How to show layer properties ? The “adjustable spanner ” tool available in the toolbar above the map can be used to adjust a selected layer’s properties (highlighted). Three different tabs represent one property each. The “About” tab can be used to adjust the selected layer’s title. The name corresponds with the login used by the partners to identify the layer. The description explains what the layer represents. The “Styles” tab enables to adjust the symbols attached to the layer and in this way display a different legend than the default one. All adjustments made with this tool are immediately visible on the map. Do not hesitate to move the propriety window with a click and drag on the title bar. Why does the map change when I zoom in ? When you zoom in, the geoportal tool enables you to reach another display scale. Each of the scales enables to visualize more or less information contained in a layer. The more you zoom in, the more the information you will reach will be precise. However, a bigger zoom reduces the spatial extent that is displayed in the cartographic interface window. Thus you need to find a compromise between information and spatial extent. Why does my layer not display, even though I added it ? Some layers contain information that is visible from a certain scale onwards. That is why the default zoom level, when you add a layer, does not always enable you to see the layer's information immediately. So you have to zoom in on the map. The layers are displayed as from a certain predefined scale level. What are the themes and sub themes used for ? The themes and the subthemes permit a subject-based search. . By using the small map on the homepage all maps can be readily found on the basis of these themes. The themes and sub themes can also be used when searching using the search engine. In order to carry out a search, every new map must be linked to a theme and a subtheme. If a map could be linked to several themes, select the most significant one. How do I share a map ? A map created by a user can only be shared with other subscribed users of the geoportal! First and foremost, you can only share a map if you are subscribed and connected to the geoportal. That is why you need to make sure you are connected and/or subscribed (see GENERAL - How do I register on the website?). A green ribbon above the cartographic interface confirms that you are connected. Once you are connected and you have created your map, save it with the "Save the map" button. Then enter the title of your map as well as a short description of its content. Save this information by clicking "Save" in the lower right corner of the window. Your map is now created and ready to be shared. To share it, scroll down the map until you reach the item "Share". Click the button next to "Add a user" and enter the e-mail address of the user you want to share your map with. Reminder! It is impossible to share a map with a user who is not subscribed to the geoportal. Furthermore, it is essential to enter the e-mail address that the user has chosen when he subscribed so this address can be recognized. Which are the INSPIRE themes ? How can I distinguish INSPIRE data from other data ? The Brussels geoportal collects various spatial data of the Brussels Capital Region. The data that come across in the INSPIRE themes can be distinguished from other data via the keyword "Reporting INSPIRE". All the keywords appear in grey under a data found with a search via catalog or can be consulted in the metadata file. How to launch a search query ? 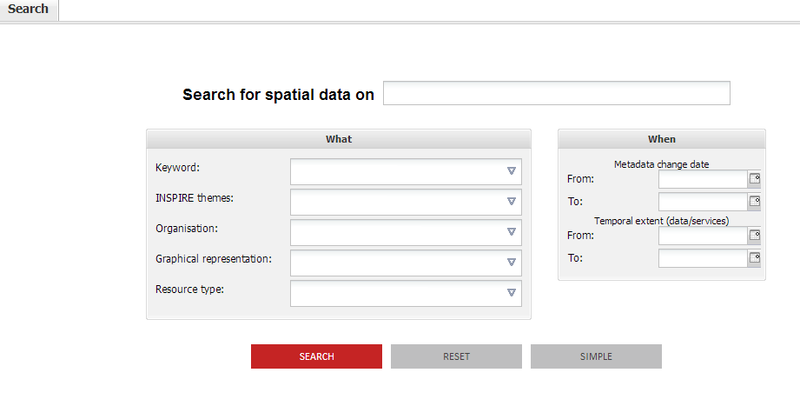 Type a keyword in the search field “Search for spatial data on” and select the suggestion, if any. For a simple search query, click on [SEARCH]. To clear the search input field, click on [RESET]. For an advanced search query, click on [ADVANCED]. To return to a simple search query, click on [SIMPLE]. To clear all fields, click on [RESET]. How to show search results ? After launching the search query, you will obtain the results in a new “Results” tab page. The results can be sorted by relevance, title or change date, using the “Sort by” menu. To get a better view, you can change the view mode. The permalink to the search query containing your keyword is accessible via the last button to the right. The results list can either be exported or consulted. How to export the results list ? First, select those results in the list that you want to export. in batches, via the “Select” menu. Subsequently, you can export the results in different formats, via the menu “Other actions”, which is accessible by clicking on the button situated in the right upper corner. What can you do with a metadata file ? In the results list, click on the title of the metadata file you are looking for. This will give you the metadata file. The “View mode” menu enables you to change the view mode. or the “Actions” menu of the results list, which appears when you drag the mouse over the result item. By clicking on the “Actions” button, you will obtain a menu with a number of options for viewing or saving the map. To print the information or activate the tooltips, you click on the button and the button, respectively. These buttons are located at the right end of the toolbar. Use the tabs in the upper part of the window to return to the search query of the results list.